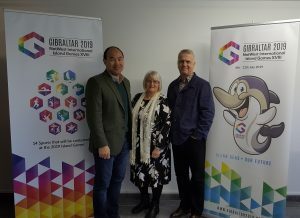 The University of Central Lancashire (UCLan) and the Gibraltar 2019 NatWest International Island Games Organising Committee today signed a memorandum of understanding whereby UCLan Sports Therapy and MSc Sports Medicine staff and students from the School of Health Sciences and the School of Medicine will offer a range of medical services to support the Island Games to be held in Gibraltar between July 6th and 12th 2019. UCLan will provide pitch-side care at all 14 sports as well as managing a polyclinic available to all the 1800 competitors and 300 officials. “The Organising Committee are delighted that UCLan staff and students will be supporting the Games in July. This will be the first time that an Athletes Polyclinic will be provided at an Island Games to the level planned and hopefully will be continued at future Games as a legacy project”. In the lead up to the games, students will be undertaking a series of training workshops which will focus on managing injuries within this environment specifically exertional heat illness. They will also be designing a range of emergency action plans for each of the venues to assist medical services on site.